A salute to the women in my family tree. Who leans against a good tree, is well shaded. When I reflect on my family tree, I consider myself very lucky.I feel that a lot of my good fortune and the strength (and shade) of this "family tree" is due to my female ancestors. All family researchers, find that when it comes to researching their grandmother, great grandmothers and great aunts that it is more complicated than searching for information on our male ancestors. They are often the forgotten ones in the family story. As all family tree researchers know, the search for information on their female ancestors always presents special problems. One of the main reasons for this is that women usually change their names when they marry. However, social and legal status in times gone by also contribute to this difficulty. Though there have been some matriarchal societies, on the whole our history has seen women as being subject, to a greater or lesser degree, to the control of men. With this in mind, this blog is my attempt to give some of the women that came before me an identity. I think they deserve to have their stories told, after all they were the ones who bore the children, held the families together and carried on family traditions. They have played a valuable part in providing me with a strong, and well shaded tree to lean upon. 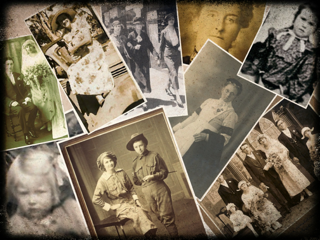 Please join me on this journey, and lets share stories of the women in our family trees.